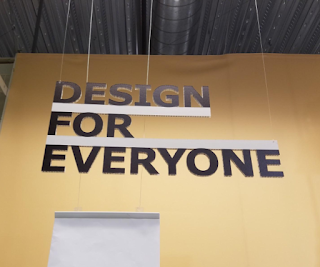 One year ago, I published "Be the Change" that began Create Accessibility. That blog post was motivated by my experience leaving Boulder, Colorado and the Google Innovation Academy. One year later a lot has happened that even I didn't realize until I did the numbers below. Countless Memories, Friendships, and Learning! It would be great if any one of these solutions actually solved the pressing problem in education that I continue to address with this project. Unfortunately, there remains lots of online materials and platforms that are inaccessible to people with disabilities. Personally, I encounter inaccessible content on a daily basis, attend EDU conferences where videos lack captions, and encounter vendors selling products for school use that are not created with universal design principles in mind. At times throughout the last year, I have felt absolutely crushed by the enormity of this issue and how it personally affects me. I can't hide from it. It's always there. And, I can't remove myself from the conversation. Even though the year is up within the #GoogleEI program, the work must continue. It is really difficult to quantify the effect of Create Accessibility during the last year. I still regularly engage with people and vendors who aren't exactly embracing the accessibility mindset yet. However, I believe that the people who direct message me for captioning workflow advice are now captioning and displaying captions on their content. 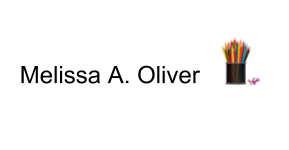 I believe that those conference presenters who I shared objectional content screenshots of the videos used in their presentation are now vetting their videos for accessibility. I believe that those individuals who I have met over the last year and shared aspects of my story and the effects of inaccessibility are now producing and sharing accessible content. I hold fast to the idea that these continued small changes will create noticeable larger changes over time. I believe that the needle has moved just a little towards increased accessibility within the EdTech community. Yet the problem remains and will take more champions and even more solutions moving forward. The Next Year of Create Accessibility. Besides keeping the resources I have already created up-to-date, I have a few new things planned for the upcoming year. 1) A Dedicated Create Accessibility YouTube Channel. The shell is created and now just needs some content. I have been inspired by Rob Dobson's AllyCasts Series that is quite technical with the intended audience of developers. I want to do something similar but with teachers and students as the audience. The prospect of creating and filming a YouTube series is both slightly terrifying and exciting which is exactly why I need to do it. The video format, done well, will be more engaging than print resources and has the possibility of reaching a larger audience. 2) Ongoing District Level Communication regarding Accessibility. This project I am beginning during the 17-18 school within my school district to communicate regularly to all staff on building awareness and skills around accessibility. As more and more schools are faced with complaints from the Office of Civil Rights (OCR) complaints regarding the accessibility of their websites and other online material, I feel like others will benefit from sharing this communication project. 3) More Integrated Accessibility Conference Presentations. I have gotten great feedback from my Create Accessibility presentations but the topic doesn't exactly pack the rooms. These presentations tend to attract people who are already working in this area of accessibility and wish to learn more. If I want to create the change I desire, I need to get in front of people who aren't already thinking about accessibility. I've packed rooms with 100+ people on topics such as Google Drawing or Google Slides, so my goal is to develop some presentations where accessibility is part of the content but not necessarily the focus. I believe this will help provide a larger audience needed to move the needle more. 5) ?????. 525,600 minutes or 1 year is a long time and completely open to possibilities of new partnerships, new skills, and new opportunities for Create Accessibility. 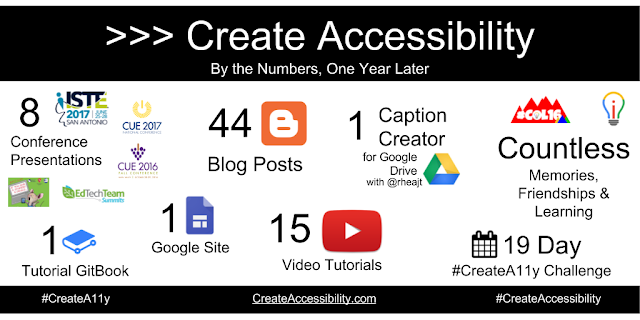 I'm excited to see how Create Accessibility grows in the next year.